Finding pants that perfectly fits our shapes is not an easy task. There are many morphologies and women and this is why, among ready-to-wear collections, there are more and more stretchy jeans and pants and very few classic trousers because it is virtually impossible to create a model that goes to everyone. Get someone to help you. That “someone” will also be very useful when you will make adjustments. To have beautiful pants, one must already have friends. 1. Mark A on the waist line, 20 cm from the left long edge of the sheet. Calculate AB = ¼ of the hips size and draw two vertical lines from A and B (Figure 1). 2. 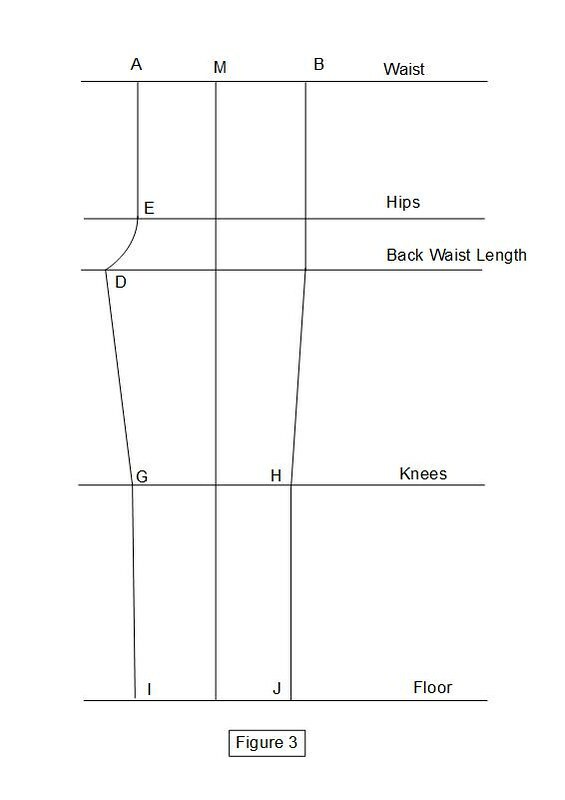 On the back waist line, add DC to the left of the vertical line from A, where DC = 1/20 hips size – 1 cm. 3. On the bisector line for DCE (line that divides the angle into two equal angles), mark CF = 2.2 cm. Then draw a curve for DFE (Figure 2). 4. Calculate MB = (AB + CD) / 2 and mark M on the waist line. From M draw a vertical line that represents the crease. Write down the measurements AM and MB on the pattern, they will be needed for the construction of the back. 5. 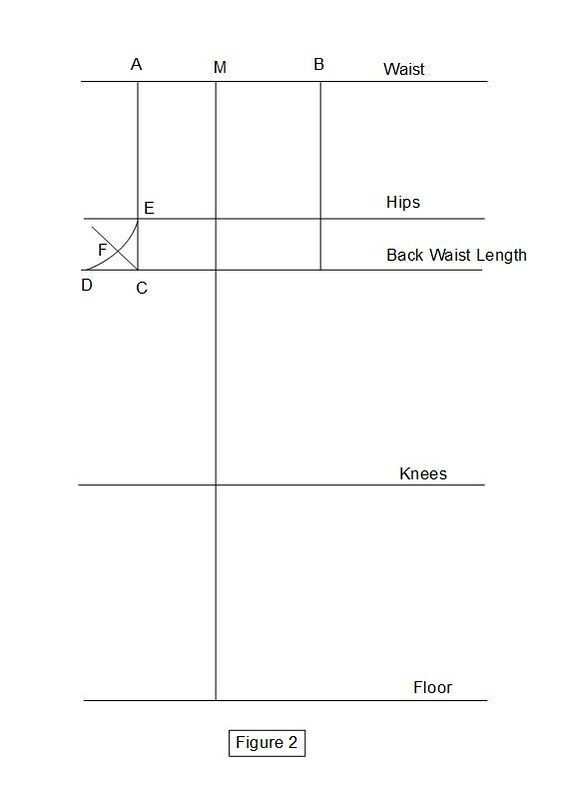 Calculate GH = knee circumference / 2 – 1 cm and divide the result between the two sides of the crease. 6. Calculate IJ = desired wingle circumference / 2 – 1 cm and divide the result between the two sides of the crease (Figure 3). 7. The back pattern will be drawn to the right of the front pattern. Mark BK = 15 cm and AB = KL. From K and L, draw two vertical lines at the waist line. 8. On the waist line mark a point M’ in order to have KM’ = MB and M’L = AM and then draw the back crease from M ‘. Add NO = 1/20 hips size + 2 cm (FIG. 4). 9. On the vertical line passing through O, measure 2 cm below the back waist line and place a point P.
10. On hips line, measure 3.5 cm to the left of the vertical line from K and place a point Q. Also mark 3.5 cm to the left of the vertical line from L and place another point R.
11. On the waistline mark SK = 1.5 cm. 12. Draw a short line, 2.5 cm above and parallel to the waist line. 13. 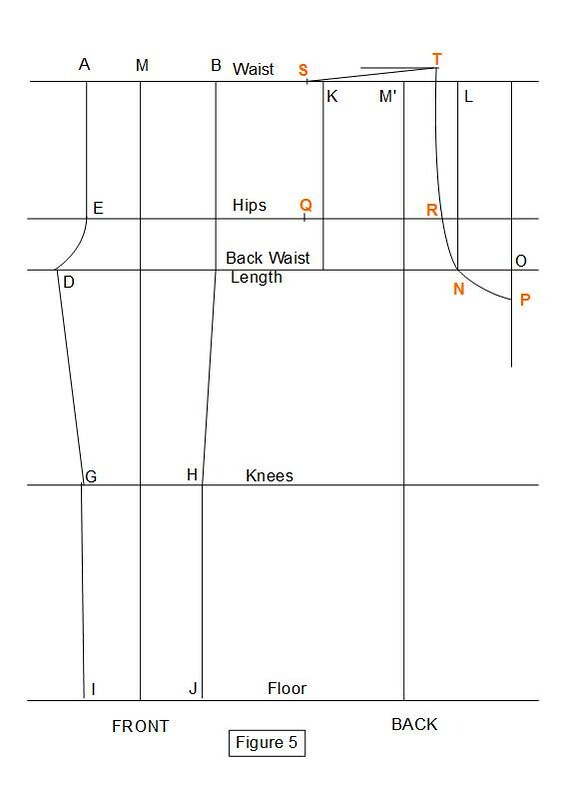 Calculate ST = ¼ waist size + 2.5 cm and mark this measure from the point S to the extra line above the waist at the point T. Join TRNP points by a curve (Figure 5). 14. Calculate UV = knee circumference / 2 +1 cm and divide the result between the two sides of the crease. 15. Calculate WZ = Desired ankle circumference / 2 + 1 cm and divide the result between the two sides of the crease. 16. Join points placed on the vertical and horizontal lines by either curves or straight lines (Figure 6). The construction of the pattern is partially completed. You will also need to add the waist darts and the ease. But as there were any more letters left in the alphabet I decided to continue the pattern in the next article. This entry was posted in Patterns and tagged basic shell, pants, trousers. Thanks for your site, I visit here quite often – I love your tutorials and drawings. One question. 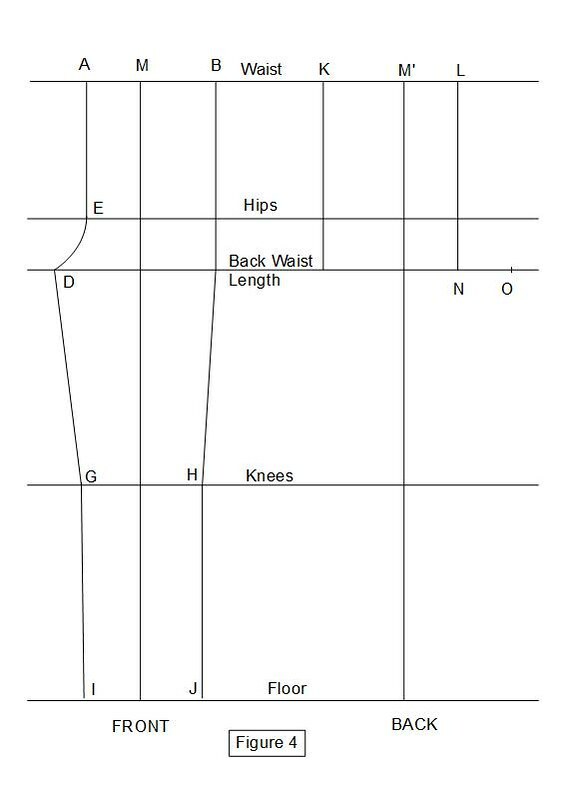 How to you measure back waist length? From where to where on the body? Sitting or standing? I’ve tried to take measurements for drafting or altering trouser patterns often, but I come out with different values for this measurement every time! Is the back waist length the same as crotch depth? I have been making jeans for a year or more now. And have made my patterns from existing pants. I really wish I could understand how you do this. I am much more of a visual person do you have a video of this tutorial? Or know where I can find? Dear, It was very helpful,very simple I am new for swing I was trying some other and not understand how to make crotch or I mean not understand the measurement specially they put front with back but you make it separate. Hi Sofy Mohan, what measurements did you exactly insert and what values did you obtain for hips and waist? Thanks for your advice through the pattern of trousers. Thank you for this! It makes patternmaking look very easy. However, there is one thing that I do not understand: the corner of the waistseam and the centerback seam is not an 90 degrees angle. So, when sewn together, the waistline will not be a straight line but it will be a bit pointy. Is that how it should be? Hi Joanna, if you refer to point T, indeed there is no 90 degrees angle. However, knowing that TR is not exactly parrallel to the grain line, when you sew together the 2 legs, the fabric stretches a little bit and ST becomes a curve rather than a pointy angle. Thank u for this tutorial. It is very useful can’t wait to give a try. This is so clear, so detailed and so meticulous! Thank you…I am new to sewing (and maybe too old to pick up things quickly ), but this is crystal clear.I am now encouraged to try making pants. One small question…if one does not have a flat stomach is there a way to accommodate the belly? Thanks for your tutorial Janaki. I wanted to know how you divide GH on both sides of the crease in Fig 3. They are not equally divided. Is it the same as AM:BM? Thanks for your excellent drafting tutorial. Does UV and WZ measure equal on either side of crease line? Compared with GH and IJ, it doesn’t appear proportionate. Could you please clarify this. Hi Janaki, what type of french curve do you need for this pattern? I have been looking around, but there seems to be many different shapes. You look Gorgeous 😉 I’d like to learn pattern cutting in detail. I am a beginning sewer, but was a draftswoman for 30 years. Looking forward to sewing them up. My travel pants were bought from Eddie Bauer, on sale recently, and size 2 was actually larger than a size 10. So many clothes made in Vietnam without proper quality control. Thanks so much for clear, easy to read drafting instructions. I know these will fit properly. How to take crotch length? Thanks for making it so easy i just want to ask a que is how do u mark T how many inches it should b above from waist? Will this work for making little girl pants? Hello! Your Blog is great, I’m having a great time making my own patterns with your help, but right now I’m pretty stuck with this one. 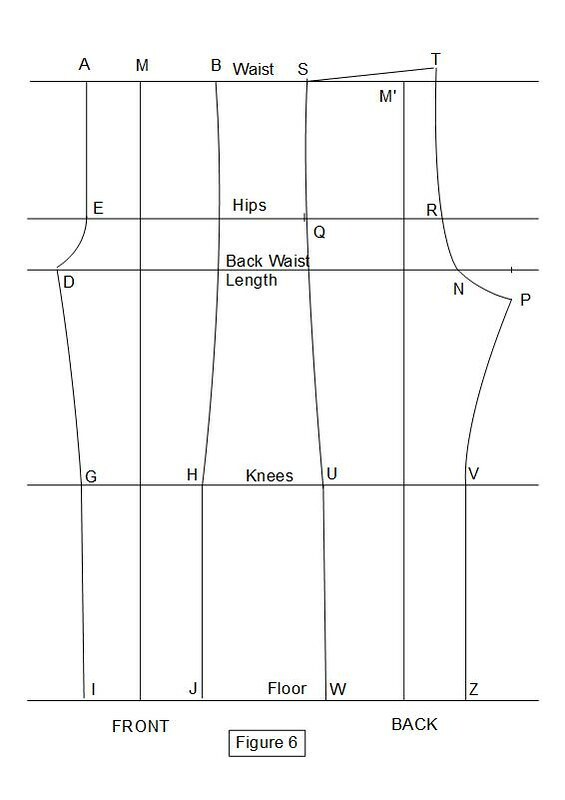 I’m hoping you’ll help me, how do I calculate the space between the hips line and the back waist length line? Is it the back waist length measurements taken from the waist line? Many thanks for this. The crease line (M`) does not appear to be at the centre of UV (or WZ). Could you explain how the positioning across the crease is calculated for these two lines please? Thank you! Hello I am student for pattern Please advice me How learn easy. I have a query regarding figure 6 , the back leg draft. I understand that the measurements for the knee and ankle are different, however it would appear from the picture that the measurements on either side of the creaseline are not equal. In your instructions no 14 and 15 you say to divide the result between the two sides of the creaseline. Should it be equal and if not how is it calculated. Thanks for this. I hope it works well. do I need to add seaming allowance when cutting the fabric? Hello, these are helpful aids for me as a Design, cutting and tailoring student beginner! Nice. Very well written. I need to sew for husband who has a longer rise than most recay to wear for men and more in the buttocks than ready to wear. Is there a different formula to drafting the crotch curve for men’s pants? Can you tell me this or point me to where I can find this information? I have been searching and just cannot find this. Thanks.